Provides visual and audible feedback for mouse clicks. Is there a better alternative to Did I Click? Is Did I Click really the best app in System category? Will Did I Click work good on macOS 10.13.4? 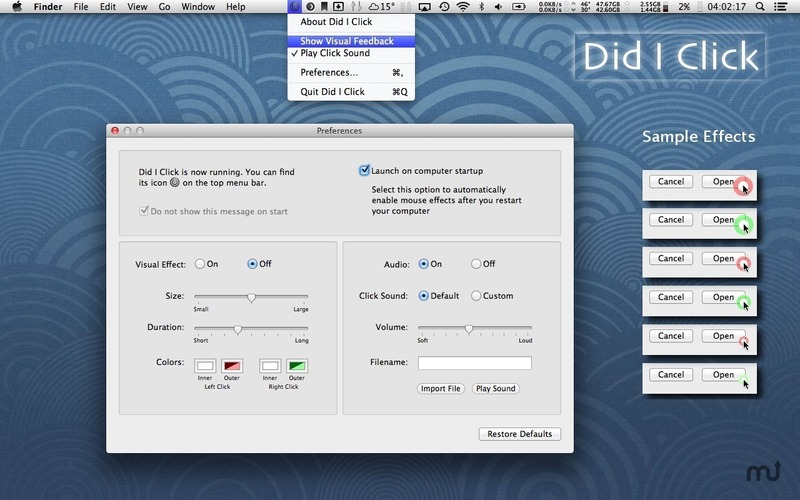 Did I Click provides visual and audible feedback for your mouse clicks. Sometimes we miss the target. Sometimes the click is not detected. Sometimes the computer is just busy and it takes a little bit to react. With Did I Click, you will see (and optionally hear) a target effect on the cursor right after the click. And it never fails. So, if you didn’t see (or hear) the effect, the click was not recognized. Period. Did I Click needs a rating. Be the first to rate this app and get the discussion started!